Dozens of Palestinian and Lebanese activists and civilians took to Beirut streets on Wednesday to commemorate the 33rd anniversary of the 1982 Sabra and Shatila massacre which butchered some 3,000 Palestinian refugees in Lebanese refugee camps. The rally-goers flocked to the cemetery where the slain refugees were buried, lifting Palestinian and Lebanese flags and holding banners calling for the prosecution of the Israeli and Lebanese criminals responsible for the genocide. A statement by the Thabet Organization for the Right of Return said the Sabra and Shatila massacre is one of history’s most live proofs of Israeli terrorism against Palestinian refugees. “The memories of the Sabra and Shatila massacre have survived in the minds of the Palestinian refugees and the world’s pro-Palestine activists,” the statement proceeded. It added that the Sabra and Shatila genocide can never be subject to the statute of limitations, urging Abbas’s government to instigate a legal battle against the perpetrators of the massacre. Between September 16-18, 1982, in the middle of Lebanon's civil war and a few months after Israel's invasion of the country, hundreds of members of the Phalange party - a Lebanese Christian militia - in collaboration with the Israeli army, slaughtered about 3,000 Palestinian refugees, mostly women, children, and the elderly, in the Sabra and Shatila refugee camp located in Beirut. Talking to al-Jazeera 30 years after the massacre, survivor Siham Balqis said: "I remember there was one Palestinian boy from the Salem family, in his early 20s, who donned a doctor's coat to try and escape. The Lebanese caught him, realized he was Palestinian, and pumped his body full of bullets." "They would pick on the men at random and make them crawl on the floor. If they thought they crawled well, they assumed it was due to some sort of military training, so they took them behind a sand bank and killed them," Siham added. According to Siham’s version, the Lebanese fighters took those they had not killed and forced them to march over the dead bodies scattered on the streets toward the large sports stadium on the outskirts of the camp. "We were made to walk over the dead bodies, and among cluster bombs," she said. "At one point I passed a tank, where the body of a baby only a few days old was stuck to the wheel." 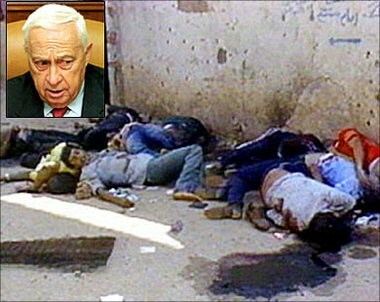 Quoted by the PIC, a historiographer said the real atrocity inflicted by the Sabra and Shatila genocide lies not only in the memories of civilian cadavers, including children and women, thrown in streets like the muck heaped up on trash tips amid the nauseating smells of injustice, oppression and, barbarism emerging from the little bodies of those innocent children; the atrocity of the Sabra and Shatila mass-slaughter lies also in the fact that none of the Israeli and Lebanese criminals were sued or even held responsible for the butchery as if the bodies and souls of the thousands of children and women slain in no more than 24 hours’ time are not worth the prosecution such tragedies quite naturally and quite “humanly” call for. 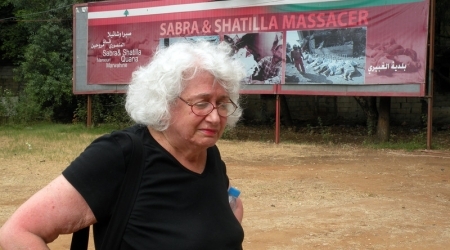 The 33rd anniversary of the 1982 Sabra and Shatila genocide, marked on September 16, comes at a time when Palestinian refugees in Syria and Lebanon have been subjected to dire socio-economic conditions, enduring poverty and risking death at sea onboard smugglers’ boats to seek a refuge somewhere oversees. The occasion also coincides with simmering tension flaring up at and around Muslims’ al-Aqsa Mosque due to Israel’s swelling break-ins and vandalism against such a highly-sacred place of worship—the third holiest site in Islam. One of Israel’s most infamous crimes occurred 33 years ago this week. In September 1982, the Israeli army surrounded the Sabra neighborhood and adjacent Shatila refugee camp in southern Beirut. Israel gave its allies in a right-wing Christian militia known as the Phalange free rein to massacre a large number of Palestinian and Lebanese civilians living in the area. Israeli troops even shot flares into the night sky to help the Phalangists find their targets. Exactly how many were killed between 16 and 18 September 1982 remains unknown. Estimates vary from 800 to 3,500; the real number is hard to determine because bodies were buried quickly in mass graves or never found, and many men were marched out of the camp and “disappeared.” No information has been released about them to this day. Perpetrators of the Sabra and Shatila massacre, which butchered some 3,500 civilians, shall forever be chased down by the Palestinian people and international community alike, Hamas said on the occasion of the 23rd anniversary of the Sabra and Shatila massacre. Hamas office of refugee affairs said the barbarism and atrocities inflicted on civilian children and women in the Sabra and Shatila massacre are no less horrendous than the horrors currently inflicted on the Palestinian people in Occupied Jerusalem. The office called on the Palestinian people and institutions to keep the history of the notorious genocide—painful as it has always been though—alive in their memory and that of the younger generations. its allies in Lebanon for the genocide. Analysts said the real atrocity inflicted by the Sabra and Shatila genocide lies not only in the memories of civilian cadavers, including children and women, thrown in streets like the muck heaped up on trash tips amid the nauseating smells of injustice, oppression and, barbarism emerging from the little bodies of those innocent children; the atrocity of the Sabra and Shatila mass-slaughter lies also in the fact that none of the Israeli and Lebanese criminals were sued or even held responsible for the butchery as if the bodies and souls of the thousands of children and women slain in no more than 24 hours’ time are not worth the prosecution such tragedies quite naturally and quite “humanly” call for.